Brett Dean has a rare gift, an ability to make the avant-garde accessible, and without any compromises. He now holds a position similar to Luciano Berio in the previous generation, as the composer of serious Modernist music that always keeps its face to the audience. Both composers often employ a Postmodern element in their music to achieve this, writing works with clear links to the much-loved music of earlier eras. But both also pursue more abstract paths, though even then giving helpful clues—evocative titles, clear thematic or textural ideas—to allow listeners to keep up. The five works presented here come from relatively early in Dean’s career and present a compositional voice gradually approaching full maturity. All of the textural, timbral, and even structural ideas that make his more recent works so successful are already securely in place, but what’s often missing is a sense of substance, of having an important message to express. Or perhaps that is the wrong way to approach this music. The opening work, Etüdenfest (2000), was inspired by the sounds emanating from conservatory practice rooms. It is filled with extended string techniques, playfully layered and juxtaposed. There is a quiet and often haunting atmosphere to the work, but Dean seems determined to ground the music in its own prosaic origins: Just when you feel something emotionally profound is about to happen, he introduces an obbligato piano, incessantly practicing his arpeggios. And then the work ends. A playful étude and nothing more. But the brittle, half-lit atmosphere of Etüdenfest continues throughout the program. In Shadow Music Dean orientates the entire work around the idea of shadows, with dark sounds and eerie percussive effects looming out of indistinct background textures. Winds and percussion are added to the ensemble, following the strings and piano of Etüdenfest, but this is still predominantly string music, and while Dean writes proficiently for every orchestral section, it is always the strings that get the majority of the interesting extended techniques. Short Stories (2005) is, as its title suggests, more pictorial and more narrative. The five “interludes” each have a different character, the quieter ones following the shadowy mood of the previous two works. A narrative quality comes through more strongly in the faster music, where we hear long, weaving violin lines drawing the ear onwards through the ever-beguiling textures. No actual stories are told (or at least acknowledged by the composer), apart from in the penultimate movement, “Komarov’s Last Words,” a memorial to cosmonaut Vladimir Komarov, the first casualty of space flight. The BIS label has done great service to Brett Dean’s music, and this is just the most recent in a long line of excellent SACD recordings. Dean himself conducts here, and the focus on textures and balances that characterize his composition transfer well to his work at the podium. The pace at which he unfolds these works always feels patient, searching for, and achieving, excellent clarity in each of the textural ideas he presents. 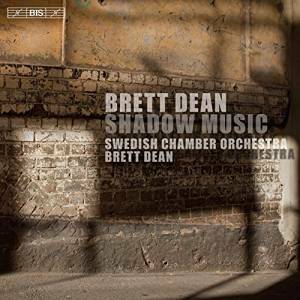 Orchestral playing is excellent throughout: It always seems to be with Brett Dean’s music, a virtue, no doubt of his idiomatic writing. Recorded sound is very fine, too, clear SACD audio, not the kind that shows off its high fidelity credentials, but instead articulates the details without any harshness or edge and gives subtle but valuable weight to the bass. None of these works is labeled as a first recording. With Etüdenfest, Shadow Music, and Testament, BIS is here catching up with ABC, who recorded the three works with the Tasmanian Symphony (ABC 4763219, released 2014). The latter work is an orchestral arrangement of a piece by the same name for 12 violas, written in 2002, and the original is available on BIS 2016, as a filler for the Violin Concerto “The Lost Art of Letter Writing,” to date perhaps Dean’s most accomplished work. No other recording of Short Stories appears to be available at present, but, given the huge interest in the composer’s work from a range of record labels, it is probably only a matter of time before the next appears. No need to wait though—these composer-led versions are unlikely to be surpassed any time soon. Elisaveta Blumina and the Grand Piano label have done sterling work in recent years in promoting the piano, both solo and concertante, music of post-Soviet composers. The aesthetic politics here are complicated: Silvestrov and Kancheli are both of a religious Minimalist persuasion, even when writing music, as here, that is completely secular. But that school has increasingly moved into a radical, even confrontational position, with tonality and textural simplicity presented not only without apology, but almost in deliberate contravention of Western tastes. The challenge to Modernism here is obvious, but both composers go further, and if the West is willing to concede a neo-Romantic or Postmodern dimension to recent musical culture, even that is challenged. Kancheli is quoted in the liner note extolling Romanticism, with no “neo-” attached, as ‘a high dream of past, present, and future.’ Conflict seems inevitable, if only at the level of the individual listener coming to terms with this radically ahistoric stance. Blumina herself is Russian but based primarily in Hamburg, a city with a long tradition of supporting recent Russian music (thanks largely to the music publishing industry there), so presumably performs for audiences accustomed to the challenges this music presents. She and her colleges perform the music with real conviction, and there is no sense that the players share my reservations. As such, then, this is an important release, not least because it presents two world premiere recordings, and excellent performances of two other rarely heard works. Such reflections have little relevance to the first work on the program, although it somehow manages to fit neatly into the ethos of the recording. Galina Ustvolskaya’s Concerto for Piano, String Orchestra, and Timpani was written in 1946 when she was 27 years old and just completing her studies at the Leningrad Conservatory (following a long disruption caused by the siege). The style is some distance from the austere Modernism of Ustvolskaya’s mature work, the single movement written predominantly in the keys of C Major and C Minor. As well as being in a single movement, the music also seems monothematic, with a four-note trochaic motif dominating from start to finish. The composer herself resisted comparisons with her most famous teacher, Shostakovich, but this motif, and its emphatic recurrence, are reminiscent of Shostakovich’s Fifth Symphony. On the other hand, that insistence, the continual focus on a single idea, repeated through different textures and harmonies, is similar to the approach in her later music: For all its tonal convention, this is music of an insistent and uncompromising bent. And, as often with Shostakovich, the positive and optimistic ending feels at least slightly ironic—exaggerated almost to the point of satire. No such mixed messages in Silvestrov’s Four Postludes of 2004. Silvestrov specializes in music with a sense of belatedness, hence the regular us of “postlude” in his titles. That can come through in stylistic play, but just as often, as here, it is achieved through an unspecific sense of nostalgia. The music, throughout, is quiet and reflective, typically with the piano giving attacks to chords and textures, which the strings then sustain in clear, uncomplicated, diatonic harmonies. Silvestrov displays an impressive skill in handling this simplicity. The way that silences are integrated into the discourse is always seamless. And although the music is nostalgic, it is never sentimental, giving a sense of focus, even efficiency, to the work’s 16-minute span. The Hymn (2001) that ends the program is in a similar spirit. This work is shorter and is written for strings alone, one to a part. The dynamic never rises above mezzo-piano, and is usually lower, and so the music requires careful concentration, and, again, a sense of deep stillness and reflection is the listener’s reward. Between, we hear Sio for string orchestra, piano, and percussion by Giya Kancheli. The work is based on, or at least invokes, the folk music of Kancheli’s native Georgia. He explores the available textures and sounds, including some prominent tuned percussion, over what feels like a series of loosely structured variations. Occasional abrupt changes of texture and mood help to define the contours of the work, and to distinguish it from the more flowing and even Silvestrov scores that frame it. 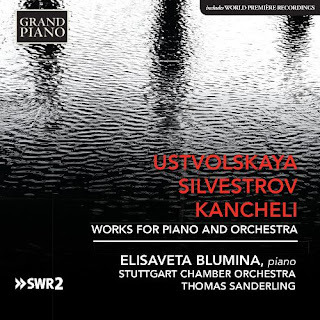 But, like Silvestrov, Kancheli favors simple, diatonic textures, doubled between the piano and the strings, and the simplest of accompaniments. For all its melodic appeal, this remains, at least for me, a radical, even provocative aesthetic stance. Excellent performances throughout from Blumina and the Stuttgart Chamber Orchestra under Thomas Sanderling. This music isn’t about virtuosity or high level technical skills, but the sheer amount of rhythmic unison and the radical simplicity of the textures make perfect ensemble and tuning a key requirement, and that is exactly what we hear. The climax of the Ustvolskaya feels a little underwhelming, but it is difficult to decide whether the performers or the, still little-experienced, composer are to blame. I could also imagine the junctions in the Kancheli to be more pointed, although excessive drama would probably ruin the effect. At the other end of the spectrum, the delicate, quiet string textures are ideal, especially for the Silvestrov. Maintaining that sound throughout the Hymn must be real challenge, and the last of the Postludes gradually disappears to nothing, a beautiful effect, especially as presented here. Leonid Desyatnikov’s opera caused a stir in Moscow when it was premiered at the Bolshoi in 2005. Protests by a pro-Putin youth organization took place outside the opera house, and an obscenity case was brought before the Duma. The controversy centered on the choice of librettist, Vladimir Sorokin, a novelist with a reputation for presenting historical figures in compromising, and often pornographic, scenarios. In post-Soviet Russia, the nation’s 20th-century history is still a sensitive topic, and radical re-interpretations stir strong emotions. The Duma investigation soon fizzled out—it turned out Sorokin’s libretto wasn’t as pornographic as his opponents were expecting. It is just as Postmodern though, and proves an ideal fit for Desyatnikov, a composer with similar interests in resurrecting (literally in this case) and radically reinterpreting the past. The opera was a commission from the Bolshoi, the first, and still only, new work by the company since the fall of the Soviet system. But given the changes in Russian society and culture in those years it could hardly be more timely, presenting modern Moscow as city of confused identity, still clinging to outmoded ideas about its past, even as they become tenuous to the point of absurdity. The plot centers around a genetic scientist called Alex Rosenthal. He arrives in Soviet Russia as a Jewish refugee from Nazi Germany, already having mastered a technique of human cloning. The reasons for his Jewish identity are not clear (to me at least), but the approval by the Soviet authorities of his research is more germane to the satire. As the story opens, he has already cloned Wagner (a mezzo voice here, Elena Manistina), Tchaikovsky, Verdi, and Mussorgsky, and is in the process of cloning Mozart. The actual opening of the first scene is an impressive coup de theatre, with an eerily amplified voice telling the audience to switch off their mobile phones before giving the background and presenting the laboratory scene. All the actual cloning procedures are presenting in suitably sinister mood: Desyatnikov’s polystylism dominates most of the opera, but he is a Minimalist too, and ominously churning repeated figures in the orchestra underpin these opening scenes. The story then follows the adventures of Rosenthal and his “children” through the Brezhnev and Gorbachev eras, with both presidents making cameo appearances. Eventually, with the fall of the Soviet system, Rosenthal loses his funding and soon dies. The orphaned clones are thrown out onto the streets, and the final act takes place in Moscow’s Komsomolskaya Square, a famously run-down area with the city’s four main terminus stations in close proximity. The five cloned composers are now living rough and busking for a living. Mozart falls in love with a prostitute named Tanya (Kristina Mkhitaryan), and the heroes’ efforts to buy off her pimp, Kela (Boris Statsenko), result in their all being poisoned. Only Mozart survives, and the final epilogue is a hallucination sequence, in which the four other clones return to sing in his dreams. There is obviously much subtle satire of modern Russia that is lost on me, and probably on most other Western listeners too, but the musical pastiche and commentary is much easier to engage with. 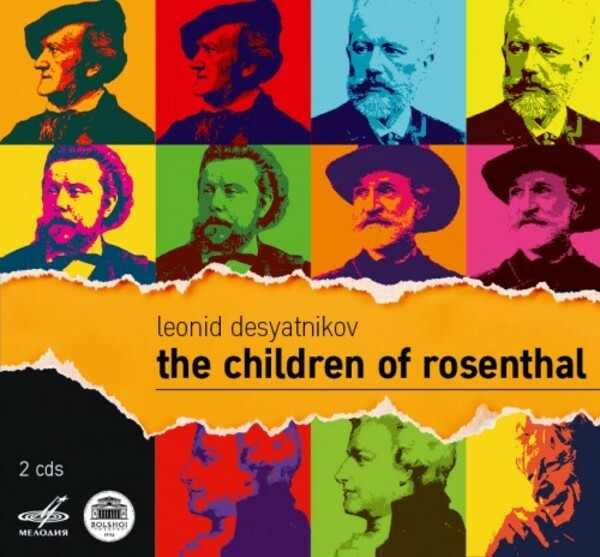 Just flicking through the synopsis, we find all sorts of allusions to the operas of the five composers, for example, act I, scene 2 opens with a number titled “Schlafst du, Wagner, mein Sohn?” Desyatnikov divides the work into sections referencing the styles of Wagner, Mussorgsky, Verdi, and Tchaikovsky. He plays a subtle game of stylistic allusion, never including any direct quotes, but often getting so close in style that the notes seem to match up with the originals. So, in the Mussorgsky section, Orthodox chant is sung by the chorus in the weighty, emphatic style of Boris Godunov, and, in the Wagner section, motifs that sound like they should be in the Ring cycle, but aren’t, regularly appear in the orchestra. The fact that the four referenced composers are almost contemporaneous means that a more generalized late-Romantic operatic style predominates, creating valuable, if slightly paradoxical, continuity across the work. But Desyatinkov often reminds us that this is not neo-Romanticism, as such, particularly in the way that he structures climaxes, his Minimalist techniques returning to the fore, with repeated lines accreting to increasingly chaotic and dissonant tuttis. Performance-wise, this is an impressive release. The recording was made in 2015, presumably live and on the Bolshoi’s huge main stage, resulting in the voices sometimes sounding distant. Balance is good though, between stage and pit, with the voices always clear. Diction is good too, and Desyatnikov’s relatively straightforward word setting allows the text to come across clearly. The cast is presumably drawn from the Bolshoi company, and all prove equal to the music’s challenges. In fact, the generally late-Romantic sound here, combined with the composer’s obvious care in writing sympathetically for the voices, makes this seem like a straightforward sing, at least for contemporary opera, although that might be deceptive. Conductor Vladimir Vedernikov finds a good balance between dynamism and clarity, and, even without the visuals, the listening experience is one of being carried along from one aural scenario to the next. Melodiya have produced an impressive package for this release, suggesting they are anticipating a high profile for it. The two discs come in a hard-back CD-box sized book, that also includes the libretto in Russian (Cyrillic) and English. They are not side by side, sadly, and, although the tracking on the two discs is generous (17 and 20 respectively), the track numbers are not included in either libretto. But these are small qualms for what is otherwise an impressive release. Hopefully a video of the production is also in the works. This opera is obviously as innovative in its stagecraft as it is in its music, and, given the specifically Russian focus of much of the satire, it is difficult to imagine a Western production at any point in the near future. Post-Soviet Russian music is a confusing field, led by composers with an increasingly philosophical and abstract approach to their art. Leonid Desyatnikov is as theoretical and abstract as they come, but don’t let that put you off this opera, which is surprisingly accessible and endlessly intriguing, at least to these Western ears.